I just discovered that President Obama picked an interesting Bible reading for the 10th anniversary of the 9/11 attacks last year: Pslam 46 - one of the passages which I highlight in the post The Casting Down of Mountains as a prophecy of the effects of the future collapse of the volcano Cumbre Vieja, and subsequent Mega-tsunami that will destroy the east coast of the Americas. These are the two olive trees and the two lampstands that stand before the Lord of the earth. And if anyone would harm them, fire pours from their mouth and consumes their foes. If anyone would harm them, this is how he is doomed to be killed. Hear now, O Joshua the high priest, you and your friends who sit before you, for they are men who are a sign: behold, I will bring my servant the Branch. For behold, on the stone that I have set before Joshua, on a single stone with seven eyes, I will engrave its inscription, declares the LORD of hosts, and I will remove the iniquity of this land in a single day. This is evidence of the righteous judgment of God, that you may be considered worthy of the kingdom of God, for which you are also suffering—since indeed God considers it just to repay with affliction those who afflict you, and to grant relief to you who are afflicted as well as to us, when the Lord Jesus is revealed from heaven with his mighty angels in flaming fire, inflicting vengeance on those who do not know God and on those who do not obey the gospel of our Lord Jesus. So by examining the significance of the various biblical allusions made in Psalm 46, we have yet again found several direct links between the Second Coming, the destruction of Babylon at casting of a burning mountain into the sea, and the battle of Armageddon. The exact sequence of events which I further elaborate on in the book, as a third world war being instigated by the Antichrist, who seizes the political vacuum left in the wake of the downfall of America following the devastating effects of the mega-tsunami caused by the collapse of Cumbre Vieja. The Israelites did not see the attacks as a harbinger of the judgment that was to fall upon the nation by the rod of Assyria, which would take place due to its state of apostasy. Instead of turning to repentance, the Israelites arrogantly promised to rebuild. Cahn points out that this context makes Sen. Daschle's use of this quote even more strange. The Lord has sent death upon Jacob, and it has come upon Israel. And all the people of Ephraim, and they that dwelt in Samaria shall know, who say in their pride and lofty heart, "The bricks are fallen down, but come, let us hew stones, and cut down sycamores and cedars, and let us build for ourselves a tower." Cahn argues that just as the precursory attacks on the Northern Kingdom of Israel were a warning sent by God, telling of the nation's impending destruction by Assyria; so too the attacks on 9/11 herald a greater chastisement still to come. A chastisement that will ultimately lead to the nation's complete downfall. In the earlier post The Two Towers and the Sixth Seal, we already discussed how the events of 9/11 appear to be intimately bound up with the future chastisement of the USA. Given that the link to Isaiah 9 was made by the leaders of America themselves in the wake of the terrible tragedy of 9/11, it seems highly significant that on the 10th anniversary of 9/11, the President of the United States unknowingly quoted a passage in the Bible that tells of the exact form the punishment will take - that mountains will be "moved into the heart of the sea", so that its waters swell, roar and foam. A passage which directly parallels the destruction of Babylon, caused by a burning mountain being thrown into the sea, as foretold in both the Book of Jeremiah and the Apocalypse. "Just as it was in the days of Noah, so will it be in the days of the Son of Man. They were eating and drinking and marrying and being given in marriage, until the day when Noah entered the ark, and the flood came and destroyed them all. Likewise, just as it was in the days of Lot—they were eating and drinking, buying and selling, planting and building, but on the day when Lot went out from Sodom, fire and sulfur rained from heaven and destroyed them all—so will it be on the day when the Son of Man is revealed." "And if the Lord had not cut short the days, no human being would be saved. But for the sake of the elect, whom he chose, he shortened the days." "to deceive the nations that are at the four corners of the earth, Gog and Magog, to gather them for battle..."
"And when you hear of wars and rumors of wars, do not be alarmed. This must take place, but the end is not yet. For nation will rise against nation, and kingdom against kingdom. There will be earthquakes in various places; there will be famines. These are but the beginning of the birth pains." When we look at the Prophecy of Pope Leo XIII concerning the hundred years of Satan's power, we find that this too is styled after the trials of Job. 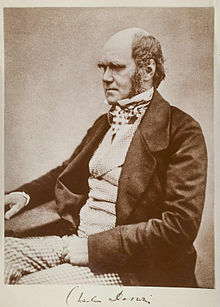 And it is also interesting to note that in Melanie Calvat's later (unapproved) 1858 version of the secret of La Salette, she foretold that the gradual weakening of faith that would result in the Great Apostasy would begin in a time period very close to her own - which was around the same general time period of the publication of the Origin of Species. "Evil books will be abundant on earth and the spirits of darkness will spread everywhere a universal slackening in all that concerns the service of God. They will have great power over Nature: there will be churches built to serve these spirits. "As the holy Faith of God is forgotten, every individual will wish to be his own guide and be superior to his fellow-men..."
..."The Church will be in eclipse, the world will be in dismay. But now Enoch and Eli will come, filled with the Spirit of God. They will preach with the might of God, and men of good will believe in God, and many souls will be comforted. They will make great strides forward through the virtue of the Holy Spirit, and will condemn the diabolical errors of the Antichrist." (See the earlier post on Our Lady of La Salette, to see why I believe that this later unapproved version may still have a certain amount of legitimacy). There are some interesting parallels between the major themes of Norse eschatology with the sequence of end-time events that I attempt to outline in my book Unveiling the Apocalypse. As we have already discussed in greater depth in the post The Date of the End-Time - 2012 or 2087?, Catholic theology teaches that other cultures and religions outside the Faith can be capable of genuine prophecy. 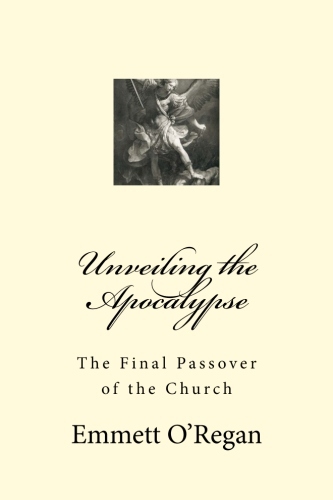 So it is possible that exploring the end-time prophecies of different belief systems can help to shed light on eschatological events from a different perspective. Given that the Norse epics were composed relatively late in comparison to the eschatological texts of the major world religions, most scholars feel that they were influenced to a large extent by Christian eschatology. Indeed many extant Christian artifacts scattered throughout Britain (such as Thorwald's Cross and Gosforth Cross) bear syncretistic imagery depicting elements of Norse end-time mythology combined with certain Christian beliefs. Chapter 51 of the Gylfaginning, found in the Prose Edda, tells how the wolf Sköll (possibly a representation of the god Fenrir) along with his brother Hati, consumes the sun and moon at Ragnarok - much like the widespread belief found in eastern cultures that solar eclipses were caused by a dragon attempting to devour the sun. The Norse believed that the sun resided in a heavenly chariot, and was constantly being chased by Sköll, and that at the end-time after the period of Fimbulwinter - when there would be three years without a summer (which sounds a bit like Ireland now at the moment:), the wolf would finally catch up on the sun and devour it. If this tale of wolves consuming the sun and moon at the end-time refers to solar and lunar eclipses, then it would be a remarkable parallel to the biblical accounts of the eschatological astronomical phenomena we have already looked at in some depth in the post Signs in the Sky. Other events depicted in the Prose Edda speak of stars disappearing, great earthquakes and the collapse of mountains, which again strongly echoes the events I sketch out in the book. Then we are told that the great serpent of Midgard, Jörmungandr will cause the sea to violently swell over the land, before a final battle between the gods destroys the earth in a great conflagration (compare this with the post Mega-tsunami). 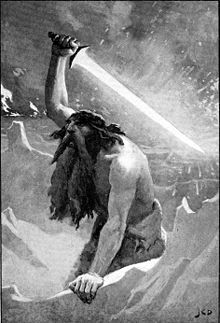 During this battle, it is foretold that Surtr, a giant with a flaming sword, will engage in combat with the god Freyr. And at the end of this conflict, the flames issuing from the flaming sword of Surtr eventually consume the earth before the creation of the new order. Heroes tread Hel-way; | Heaven is cloven." (Gylfaginning LI, the full text can be found online here). Many scholars (such as Hilda Ellis Davidson in her book Gods and Myths of Northern Europe) argue that this last part, telling of the "earth sinking into the sea" and flames and smoke billowing forth to reach the heavens, was inspired by a volcanic eruption witnessed on Iceland. So it is of some interest that this activity is associated with the flaming sword of Surtr, which eventually consumes the entire world. 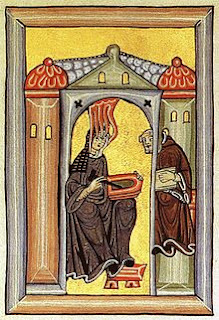 An Illustration from the Liber Scivias depicting St. Hildegard of Bingen receiving a prophetic vision. Fr Stephen Somerville was a member of the Advisory Board of the International Commission on English Liturgy for translating the new post-Vatican II Latin liturgy into the English language. Fr Somerville using scripture presents another angle linking the abomination of desolation to the end times this time in regard to replacement of the Tridentine Mass with the Novus Ordo Missae of Paul VI [NO]. Note to readers be wary of some of the other stuff on TIA, at times they unfairly go after recent popes at other points justifiably IMHO, a bit of a mixed bag. I'm all for a return to the Old Latin Mass, and the re-establishment of the High Altars. I think it would be a great blessing for the Church. But I think it is a step too far to deny the validity of the sacraments in the NO. Not only does it sow the seeds of schism in a direct disregard for the express request of Jesus that "they may all be one" (John 17:20), but it also ignores Christ's promise that the gates of hell would not prevail against the Church (Matt 16:18). Christ said "behold, I am with you always, to the end of the age” (Matt 28:20) - a promise to be eternally present in the Eucharist until the end of the world. The use of a different language from Latin doesn't invalidate the eucharist. Less beautiful perhaps, but not invalid. Christ almost certainly would have said the first Mass in Aramaic. The validity of the Eucharist depends on whether the priest was ordained in apostolic succession, and whether he was using the correct words (the personal holiness of the priest doesn't count, as was determined following the Donatist schism). For an ordained priest to invalidate the Eucharist, different words would have to be used, such as "this is a symbol of my body". Fr Gobbi depicts such a scenario for the abomination of desolation in relation to the Eucharist. He seems to suggest that the Antichrist will install an anti-pope in Rome, creating a schism, with a large portion of Catholics following the anti-pope. Fr Gobbi appears to predict that the anti-pope will then take away the sacrifice of the Mass by asserting that the Eucharist is merely a symbol of Christ's body and blood. I suppose such a scenario would fit in with Melanie's later unapproved portion of message of La Salette, that Rome would "become the seat of the Antichrist", while the true pope would be forced into exile, as is suggested by other prophecies. But I don't think that the NO is the abomination of desolation, even though it is an inferior version of the Mass. Emmett, I don't think the NO is invalid for the reasons you mention. I also don't think Latin is the biggest issue with the changes of the Mass, I think the priest facing the people (back to the tabernacle) hence being man centred, the removal of high altars and the elimination of various prayers, not to mention the stripping off churches the sacred which has led to great irreverance. The loss of the sacred is killing our times. Although he may gone too hard at times, I thought it interesting Fr Somervilles analysis that a certain abomination occuring in the temple, specifically regarding altars that would herald the end-time. Given the Masonic connections with the NO it is in a way an abomination and I believe has led to desolation, "There we have it: desolation means being desolate, being abandoned by good people, and worse, being abandoned by God and by His grace". I think many people stay away from the NO because they realise there is something seriously defective with it. When I have been to NO there appear to be few devout people, the main body of people have departed by the time the final hymn is finished. In fact some Masses I have been to I can only describe as abominations with the stuff going on. Lex orandi, lex credendi. I think it takes a special grace to attend the NO and maintain ones faith well, or at the very least a very strong grounding in Catholic beliefs. It is a sad time when most bishops seem hostile to the TLM. Our new bishop in Perth has pulled the plug on 3 trad vocations. Reading at Rorate people from all over the world commented on their dioceses being generally averse to the old Mass, something which made the Church what she is, the most beautiful thing this side of heaven. Before we go on to look at the prophecy of St. Hildegard, it should be worth noting that according to traditional Catholic theology, the Church is guided by the Holy Spirit when acting corporately as whole - which is especially so in the case of ecumenical councils held in union with the pope. If Masonic influences were responsible for the changes to the liturgy made in the wake of the Second Vatican Council, then they could only have infiltrated the Church to such an extent with the permission of the Spirit. Perhaps the changes made to the liturgy and the TLM being taken away from the Church was a punishment for the apostasy of the majority of the laity, and a large part of the clergy. As the new Israel, the Church has always been judged as a lump - the sheep together with the goats; just as ancient Israel was judged collectively for its sins with the rods of Assyria and Babylon. Apostasy does not go unpunished, and perhaps the changes to the liturgy reflect the fact that the Church as a whole no longer gives adequate glory to God. The apostate Church may simply not be worthy enough to offer the highest form of praise to Our Lord, and will first have to be cleansed with the fire of the Holy Spirit at the new Pentecost. The image of the woman before the altar in front of the eyes of God that I saw earlier was now also shown to me again so that I could also see her from the navel down. From the navel to the groin she had various scaly spots. In her [genitalia] there appeared a monstorous and totally black head with fiery eyes, ears like the ears of a donkey, nostrils and mouth like those of a lion, gnashing with vast open mouth and sharpening its horrible iron teeth in a horrid manner. As St. Paul tells us, the rebellion must come first, before the "man of lawlessness" is revealed, just as St. Hildegard predicted that the battered Church would give birth to the Antichrist. Let no one deceive you in any way. For that day will not come, unless the rebellion comes first, and the man of lawlessness is revealed, the son of destruction, who opposes and exalts himself against every so-called god or object of worship, so that he takes his seat in the temple of God, proclaiming himself to be God. Do you not remember that when I was still with you I told you these things? And you know what is restraining him now so that he may be revealed in his time. For the mystery of lawlessness is already at work. Only he who now restrains it will do so until he is out of the way. And then the lawless one will be revealed, whom the Lord Jesus will kill with the breath of his mouth and bring to nothing by the appearance of his coming. ...Then I saw heaven opened, and behold, a white horse! 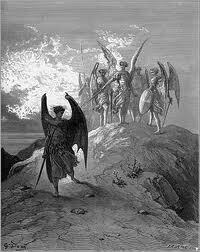 The one sitting on it is called Faithful and True, and in righteousness he judges and makes war. His eyes are like a flame of fire, and on his head are many diadems, and he has a name written that no one knows but himself. He is clothed in a robe dipped in blood, and the name by which he is called is The Word of God. And the armies of heaven, arrayed in fine linen, white and pure, were following him on white horses. From his mouth comes a sharp sword with which to strike down the nations, and he will rule them with a rod of iron. He will tread the winepress of the fury of the wrath of God the Almighty. And I will cast you on the ground; on the open field I will fling you, and will cause all the birds of the heavens to settle on you, and I will gorge the beasts of the whole earth with you. I will strew your flesh upon the mountains and fill the valleys with your carcass. I will drench the land even to the mountains with your flowing blood, and the ravines will be full of you. When I blot you out, I will cover the heavens and make their stars dark; I will cover the sun with a cloud, and the moon shall not give its light. All the bright lights of heaven will I make dark over you, and put darkness on your land, declares the Lord GOD. Now after the defeat of Satan in heaven, we await the renewal of the Church through the ministry of the Two Witnesses, when the "gospel of the kingdom will be proclaimed throughout the whole world as a testimony to all nations, and then the end will come" (Matt 24:14).